IMCDb.org: 1983 Volkswagen 1200 L [Typ 1] in "Ein Fall für Zwei, 1981-2019"
I'd say 1975+ 1200. However can't exclude later car, Mexican built. How is this be Mexican made from German made? I know we have crazy guys who import american cars (or want... like me but its too expensive for me) and i think some people imported the brazilian built Volkswagen Combi (Link to "img.turbo.fr") but believe me: No german guy who still is on his normal level of sanity would important a mexican Type 1. Especially as the differences are too small to make it interesting for collecting. I'm just saying that Mexican VW 1200 is possible here. However I can't distinguish. rjluna2 wrote How is this be Mexican made from German made? Simple reason: the Typ1-production in Germany ended on the 19.1.1978 (except the Cabriolet, which was built by Karmann until 1980). After that date the Käfer, sold in Germany (and some other European countries, too), were all Mexican made until the stop of the selling in 1985. 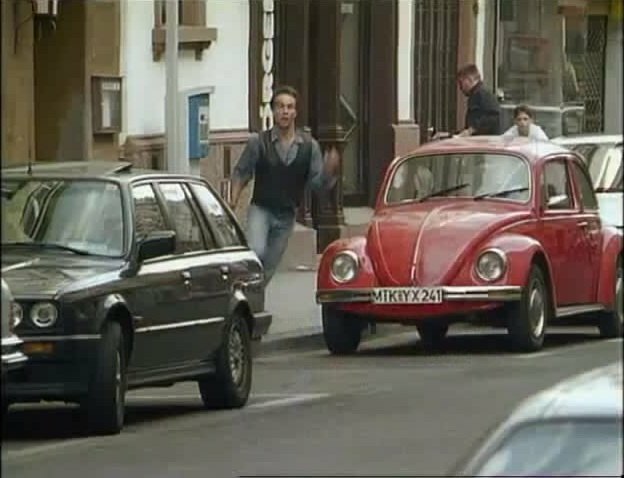 In the mid-90ies there were some Mexican made VW 1600i sold in Germany, imported by private compenaies and sold by REWE-supermarkets and PRAKTIKER-hardware stores. In 2003 some "Ùltima Edición" were imported again, also by private companies. 130rapid wrote I'd say 1975+ 1200. However can't exclude later car, Mexican built. I think, the colour is the hint. Looks like "marsrot", which AFAIK came after the German Käfer-production ran out. O.k., the plate can be changed after a moving of the owner, but it looks original to me. MTK for https://en.wikipedia.org/wiki/Main-Taunus-Kreis (the richest German district) was created in 1980. I'd go for a Mexican made car of the early 80ies.